I’ve always been enchanted by bougainvilleas from young! They flourish practically everywhere around our tropical country, whether in the urban, rural or coastal areas. They’re truly a sight to behold, especially when their colourful bracts far outnumber their foliage and these are often seen planted along our coastal roads where the sun can be blazing and conducive for blooming! Bougainvilleas are so easy to grow, relatively pest-free and needing least care yet reward generously with almost continuous blooming year round. That is why we have been growing them for nearly 4 decades in our garden. :) In those earlier years, we had many plants with bracts (either single or clustered) of varying shades such as red, orange, purple, white, mauve, yellow and pink, even bi-color ones too! However, eventually our orchids outnumber them and now currently we have only three varieties, namely ‘Mrs Eva Mauve Variegata’, ‘Aiskrim’ and an unidentified variety that’s quite similar to ‘Orange Ice’. 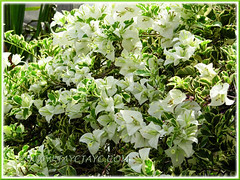 Plant type: Tropical/Sub-tropical flowering perennial vine that is native to Brazil in South America. 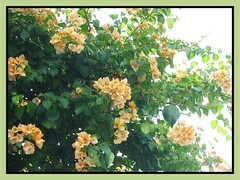 It can be trained as a shrub or small tree, grown on ground or potted in containers or hanging baskets. A vigorous-growing evergreen woody plant with or without spines, depending on the species and cultivars. Brief plant care: Requires full sun for optimum growth and flowering though it can tolerate semi-shade. Plant in well-drained potting medium of loam and coarse sand. Moist and moderately fertile soil. Needs regular water moderately and high humidity. Propagation: From seed or stem cuttings, the latter being the most favoured method. It can be easily rooted from 4- to 6-inch softwood, hardwood or leaf-bud cuttings. 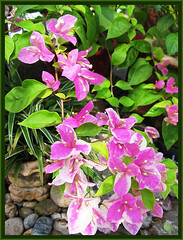 Bougainvillea glabra – rambling shrub with thinner branches and oval-shaped leaves. Thorns are short, thin and tips, curved. Bracts are triangle-shaped and pointed. 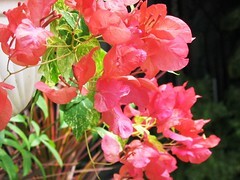 Bougainvillea peruviana – a climber with a branching habit. Thin thorns that curve as they age. Thin leaves are ovate to broadly in shape. Bracts are small, roundish and crinkly. 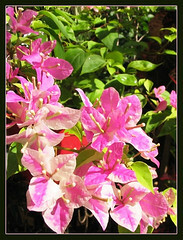 Bougainvillea spectabilis – large climber with curved thorns and hair on stems and leaves. Leathery leaves are large, ovate to rounded and hairy on the underside. Fairly large bracts that are crinkled and egg-shaped. A very dense plant with branches that are close and short. 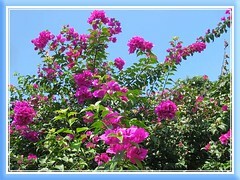 Bougainvillea Info Page, a comprehensive and valuable resource by Gordon Braswell, a retired nursery owner who specializes in Bougainvilleas. He’s very thorough and practically covers everything you need to know about bougainvillea such as its cultivation and maintenance and even describes the various species, hybrids and cultivars! Excellent work! 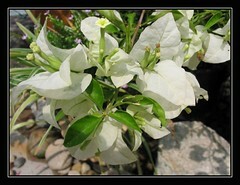 Sharing images of bougainvillea cultivars grown in our garden and elsewhere. Enjoy! 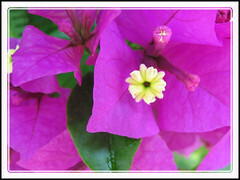 Unidentified Bougainvillea cultivar with white and deep pink bracts on the same plant and variegated yellow + green leaves. 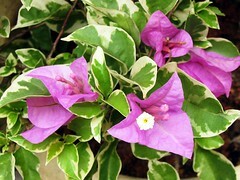 Much thanks to Dr. B.K.Banerji for identifying this cultivar as Bougainvillea ‘Thimma’. i have some doubts in bouganvilla. pleaze tell me the phytochemical found in this plant.while testing this plant i want to remove chlorophyll or not. if yes, How to removw chlorophyll. My Bougainvilla is in a large pot outdoors and it has leave that curl on it,could you tell me why? and was wondering if I should take it indoors for the winter I live in Lincolnton Ga. but bought the plant in Florida a few years ago.It has grown large so I don’t know if it’s a good idea to plant it in the ground.your help will be greatly appreciated. 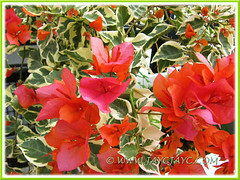 Your “Unidentified Bougainvillea cultivar is called ‘Tropical Rainbow’ at least that is its label in South Africa. I’m growing Bougainvillea in a line on the side walk next to my wall for added thorny security. And they look beautiful in full bloom. I googled further following your tip but the ID doesn’t match our plant. ‘Tropical Rainbow’ has cream-edged leaves and fuchsia pink bracts whereas ours have cream-centered foliage and trusses of white bracts as well. Whatever, thank you so much for help in ID… much appreciated. I want to grow some varieties of bougainvillea around our walls as a security hedge as well, but I dont know their names, please enlighten me. I’m a teacher at a High School. We’ve been having trouble with tresspassers on our spotrs field, that may become a safety concern for our kids. 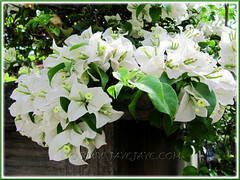 I would like to know if planting a bougainvillea as a natural safety is a possibility? In my humble opinion, planting a row of Bougainvillea ‘Royal Purple’ (a thorny and vigorous grower) is feasible for your intention. Unidentified Bougainvillea cultivar is Thimma . Pink and white bracts and foliage is variegated. 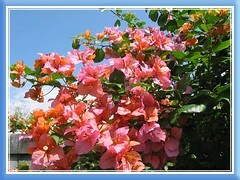 I have 40 years of research Experience in Bougainvillea. 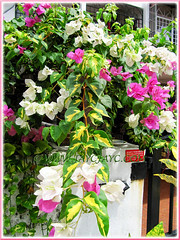 I have developed 8 cultivars of Bougainvillea. Most of them are registered with International Atomic Energy Agency (IAEA), Vienna, Austria. I am a bougainvillea lover. 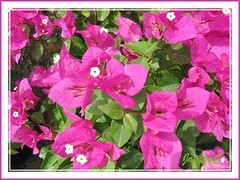 I shall be happy to mail you the details of the newly developed bougainvillea cultivars if required. 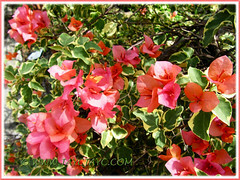 Thank you very much for identifying our bougainvillea with deep pink and white bracts, as well as with variegated foliage as B. Thimma. We are truly appreciative that you took the trouble.